Ryan Gosling Interview CRAZY, STUPID, LOVE. Earlier this month I got to head up to New York to do the press junket for the upcoming romantic comedy Crazy, Stupid, Love. The film follows three different romantic relationships and how they intersect with one another. 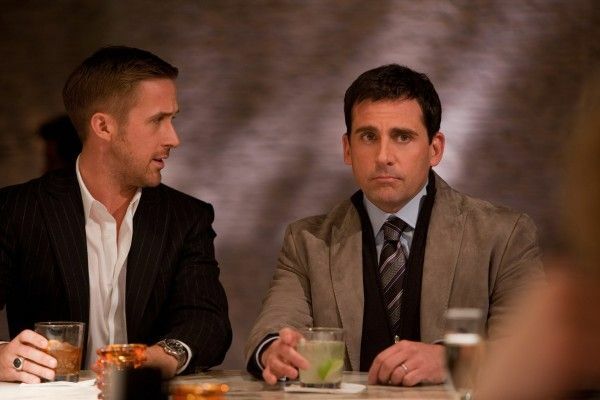 One of the film’s funniest relationships is between despondent cuckold Cal (Steve Carell) and the benevolent pick-up artist Jacob (Ryan Gosling) who decides to give Cal a makeover and help him get his mojo back. 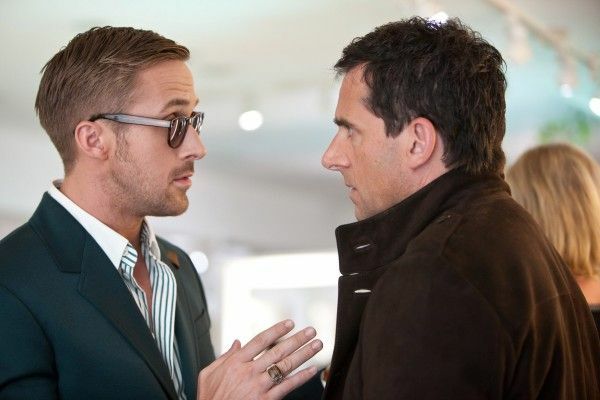 The movie is a rare outright comic performance from Gosling and he has wonderful chemistry with Carell. During the roundtable interview with Gosling, we asked him about making the shift to comedy, his upcoming projects Logan’s Run and The Place Beyond the Pines, his four-legged soulmate, and much more. Hit the jump to check out the interview. Crazy, Stupid, Love. opens this Friday. Is it possible for an alpha male to find one soulmate? RYAN GOSLING: Those are two things I know nothing about. It’s all downhill from here, I promise. I’ve been getting the soulmate question a lot lately, I don’t really know. GOSLING: Yeah, it’s my dog. His name is George. Eleven years, that’s the longest relationship I’ve ever had. They were telling us you play in a band and really know how to make those drinks. How do you go about studying for a role? GOSLING: I don’t really know what they’re talking about. So you don’t make drinks or play in a band? GOSLING: I do play in a band, but so do a lot of people. I made some drinks, but I learned how to make those drinks ’cause they asked me to. They said I had to make drinks in this movie. I went to my friend Eric, who owns a bar in downtown LA called Varnish, it’s sort of a sister bar to Milk & Honey. They do original cocktails, and he showed me how to make a few drinks. So the bottom line is you did some research to make your character real? GOSLING: It’s fun. He loves it. Did you slap him? He told us how you slapped him hard. GOSLING: You gotta slap him the next time you see him. He loves it. Doing a character like this that’s a little more out there, not as subdued as you normally are? GOSLING: You saying I’m not funny? You are funny, you’re just usually a little more subdued. GOSLING: Okay, so when I finished “Blue Valentine” I had to go get a physical from the doctor and he gave me a prescription and it said, “Do a comedy.” So I did. GOSLING: Yeah. I do feel better, so I think he was right. That in tandem with I just love Steve Carell, always wanted to work with Steve. When I first moved to Los Angeles I did a pilot, was 17, had a small part, so did Steve. We didn’t get to work together but he was so funny I would go to set just to watch him work. One time the boom guy just threw down his mic and had a laughing attack in the corner in the middle of a take. It was the first time I worked with someone who was so good it was a problem. I became a huge fan the. I watched him on “The Daily Show,” I watched all his movies. Eventually I got this opportunity to work with him so I decided to jump at it. I didn’t really think of it as a conscious choice to do a comedy, although the prescription was looming there in my subconscious, but I really wanted to work with Steve. I would have done anything to work with him. Were there times with this character that you felt like you were taking on your “Hey Girl” internet meme, playing the lothario? GOSLING: That’s so funny. (laughs) That’s my site, I run it. It was funny, because I was in before I knew about the role. I said, “Okay, Steve Carell, I’m doing it.” Then I saw the part. I wanted to play that guy, The Situation, from “Jersey Shore,” and I asked the directors and they said, “No, it’s not that kind of movie.” They wanted it to be more real. Did you have to beef up for that Photoshop scene? GOSLING: No, it was Photoshopped. Did you improvise the comment about The Gap? GOSLING: I don’t remember. I actually don’t know who owns that line, I was trying to think of it the other day. There was a lot of improvisation. Your character and Steve’s contrast a lot. What do you think the film says about modern notions of masculinity? GOSLING: One of those questions… For me, what resonated was that all the love stories grow out of friendships in the film, which I thought made it different in some way because it wasn’t perpetuating this love-at-first-sight idea. These friendships would start first then maybe it would turn into something else. That’s how we approached those bar scenes. The idea that cheesy lines don’t work and bar banter is lame. You just strike up a friendship and maybe it’ll turn into something else at the end of the night or down the road. Are you a lot like Jacob? GOSLING: I’m more like Cal, Steve’s character. That’s what’s fun about acting, to play people who are different than you. You and Emma looked like you were having a blast. What was it like working with her? GOSLING: I knew the movie was going to be good when she signed on. The whole thing really hinges on her character; my character has to give it all up for her and that has to make sense. Show me a man who wouldn’t give it all up for Emma Stone and I’ll show you a liar. Your wardrobe in the movie is very edgy and sophisticated. Does your wardrobe resemble that? Your wardrobe seems pretty casual and chill now, it wasn’t like that in the movie. 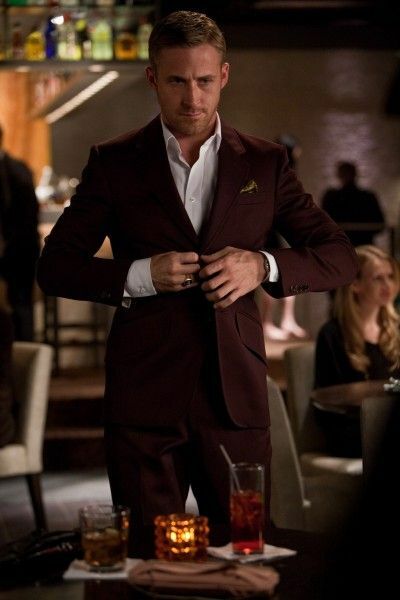 GOSLING: They didn’t give me those suits. I wanted those suits. They’re sitting in a warehouse somewhere, I don’t know who that serves. They’re there, fitted for me, not being worn by me. Now that I’m an actor and I have movies, press, I have more occasions to wear suits. I like wearing suits. You just did “Drive” and “The Ides of March” and you’re shooting “Gangster Squad” in September. You seem busier now, are you deliberately taking on more things? GOSLING: So busy. I just feel differently now than I used to. I don’t know why, but I feel more creative, I want to play more characters. I want to play everybody. I want to play you. GOSLING: We’re doing “Only God Forgives” first. Ok. Are you guys still trying to work out the script on that one and what is the visual tone? GOSLING: That’s what we’re trying to discover. We’re trying to discover the world before we get into the story. What world is this we want to be in? Then we’ll learn about what kind of story we want to see within that world. Warner Bros. has been really great, Joel Silver, giving us the time to create that. “Only God Forgives” is going to be a smaller, more character driven drama than “Logan’s Run”? GOSLING: Yes. It’s a small budget, I guess, but… it’s different. Is Nicolas Refn your Scorsese? Are you guys just gonna keep working together? GOSLING: Yes, we’re creatively dating right now, you know? We’re not married yet. You’re cheating on your 11-year relationship. GOSLING: With G? No, he’s in there too. It’s a weird thing. GOSLING: He’s just a mutt. He looks like Jim Henson made him. Appreciated your comment about the Muppet guys in the movie. You’re heading to Comic-Con with “Drive,” right? I was going to ask you about re-teaming with Derek for that film. Is it going to have the same heavy-hit of “Blue Valentine”? GOSLING: It’s very different. It’s much more… I dunno. It’s different. GOSLING: Much more immediate film. It’s about a motorcycle bankrobber. Ray Liotta’s in it. We’re gonna have to pick up the pace when Ray’s around. It’s a really interesting story about, we say “Fathers and Guns”, but it’s fathers and sons. It’s sort of about the sins of the father, the things as men that you pass on to your sons, the dragons they have to slay if you don’t slay them for you. So you just moved to NYC? GOSLING: Yeah, I just moved here. I’ve seen you around a bunch. I sat next to you at Westville East. GOSLING: Aww, so great. I like it there. Did you get the hot dogs? You gotta get the hot dogs. The double hot dogs. GOSLING: You try the gilatto place next door? GOSLING: Well right on, we’re neighbors. Have you thought about doing Broadway sometime? GOSLING: I’d like to see some Broadway shows at some point in time. I turned 30 and everyone told me I would feel different and I didn’t. So I thought I’d move to New York. Is that the reason you’re doing “Logan’s Run” because when you turn 30 you have to do Carousel?